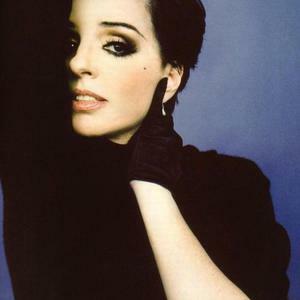 Liza May Minnelli (born March 12, 1946 in Los Angeles, California) is an Academy Award-winning American actress and singer. She is the daughter of legendary entertainer Judy Garland and her second husband, acclaimed film director Vincente Minnelli (who was of Italian and French descent). Minnelli's first film appearance was at the age of three in the final scene of the 1949 musical In the Good Old Summertime, starring her mother and Van Johnson. Minnelli started performing at age 16, in 1963, in an Off-Broadway revival of the musical Best Foot Forward, for which she received good notices. Minnelli's first film appearance was at the age of three in the final scene of the 1949 musical In the Good Old Summertime, starring her mother and Van Johnson. Minnelli started performing at age 16, in 1963, in an Off-Broadway revival of the musical Best Foot Forward, for which she received good notices. The next year, her mother invited Minnelli to perform with her at the London Palladium. The audience loved her, launching her musical career. She returned to Broadway at 19, and won a 1965 Tony Award for Flora the Red Menace. Minnelli would also receive Tony Awards for The Act in 1978 and a special Tony in 1974. She was nominated in 1984 for The Rink but lost to her costar, Chita Rivera. The film The Sterile Cuckoo (1969), in which Minnelli starred as a love-seeking teenage misfit, garnered the young actress her first Academy Award nomination. In 1972, Minnelli won the Academy Award for Best Actress for her role as Sally Bowles in the movie version of Cabaret, along with Joel Grey who won an Oscar reprising his role from the original Broadway production (that of the Emcee). Minnelli has the distinction of being one of the few Academy Award winners whose parents are both Academy Award nominees. She has also won an Emmy Award for the 1972 TV special Liza with a Z. Minnelli received a 1990 Grammy Legend Award. She received Golden Globe Awards for Cabaret and for the TV movie A Time to Live. Minnelli, like her mother, is known for her powerful vocal style, as in her trademark songs "Cabaret" and "Theme from New York, New York". Minnelli's original version of the latter, for the film in which she was a co-star with Robert DeNiro, preceded Frank Sinatra's successful cover version (for his Trilogy album), by two years. After her performance as leading lady to Dudley Moore in 1981's Arthur, Minnelli made fewer, and fewer successful, film appearances. She returned to Broadway in 1997, taking over the title role in the musical Victor/Victoria, replacing Julie Andrews. In his review, New York Times critic Ben Brantley commented, "her every stage appearance is perceived as a victory of show-business stamina over psychic frailty... She asks for love so nakedly and earnestly, it seems downright vicious not to respond." Following her 2002 wedding to David Gest, Minnelli and Gest signed with the American cable network VH1 to star in their own reality series, but production of the series was cancelled at the last minute. In 2004 and 2005 she appeared as a recurring guest star on the critically acclaimed TV sitcom Arrested Development as the lover of sexually and socially awkward Buster Bluth. On January 1, 2006, she sang "New York, New York" at the second inauguration of New York City Mayor Michael R. Bloomberg. Other famous performances were at the 1978 Studio 54 party honoring New York City's revival, at which a guest was Mayor Ed Koch; the reopening of the Statue of Liberty on July 4, 1986; and at a 2001 New York Mets baseball game that was the metro area's first major sporting event after the September 11 attacks.